The U.S. Navy understands the strains created when they put a large crew in a small space, and that’s why sailors go through a series of rigorous psychological tests before being assigned to submarine duty. Even on a large modern nuke, the confined space and constant abrasion is a breeding ground—a nautical petri dish, if you will—that quickly turns minor irritations into serious problems. Passagemaking aboard your boat, unfortunately, has a lot in common with sub duty: restricted space and nowhere to “get away.” Even worse, many of us invite guests aboard for cruises based on little more psych testing than an hour at a cocktail party. And that’s one of the reasons why I’ve learned to love catamarans. For any given length, they offer far more space and “get away” room than a monohulled motoryacht far larger. It’s no surprise that catamarans, both power and sail, have become such a popular offering in charter fleets worldwide. 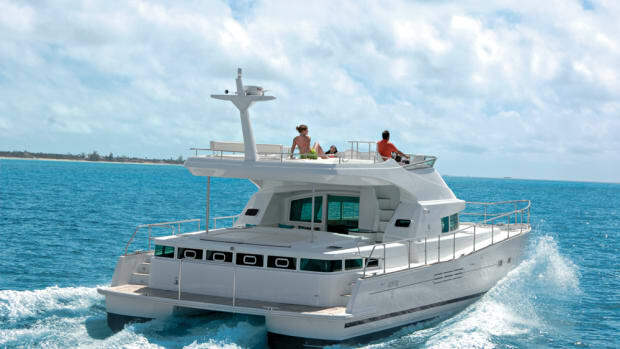 The Leopard 39 Power Cat is a fine example of a modern catamaran motoryacht, and it is perhaps better known as the Moorings 393 PC, a mid-size bareboat charter yacht offered by The Moorings, which was also responsible for the gestation of this product. With more than 40 years of customer feedback, The Moorings pooled its expertise with Robertson and Caine, the South African boatbuilders whose sailboats and power cats populate the Moorings charter fleets. When charter clients started asking if they could buy these cats, not to be put into charter service but as personal yachts, a spin-off business was created. The Moorings, under their Leopard Catamarans label, is now the worldwide dealer for these cats, and it was through their Florida office that I spent a most delightful day aboard the new Leopard 39. Before looking at the 39, it’s important to place the Leopard brand in the passagemaking world. It’s easy to scoff and say that it’s just a fluffy charter boat best suited for the benign waters of the BVIs—a wannabe cruiser at best. But bear this in mind: There are more than 800 Leopard Cats that have sailed more than 7 million miles (7 million!) on all the world’s oceans. They have, according to the builder, more than 4 million miles of transoceanic passages to the Caribbean, Mediterranean, South Pacific, Hong Kong, and the rest of the world, since most of these yachts are delivered to charter fleets and private owners on their own bottoms from South Africa. However you measure it, those numbers put these cats firmly in the passagemaking record books. 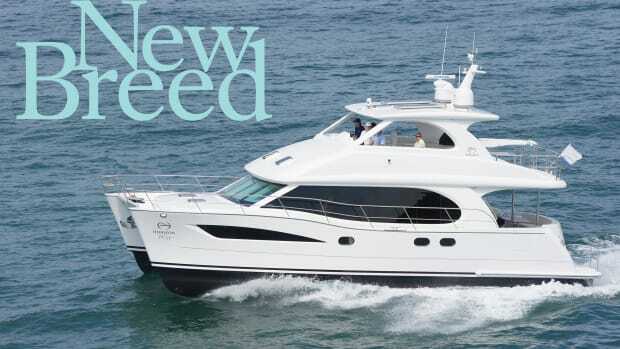 When you first step aboard the Leopard 39, the first thing you need to do is put her length (38 feet and 7 inches) out of your mind, because nothing you are going to see bears any resemblance to a conventional 39-footer. Even boarding her is different. 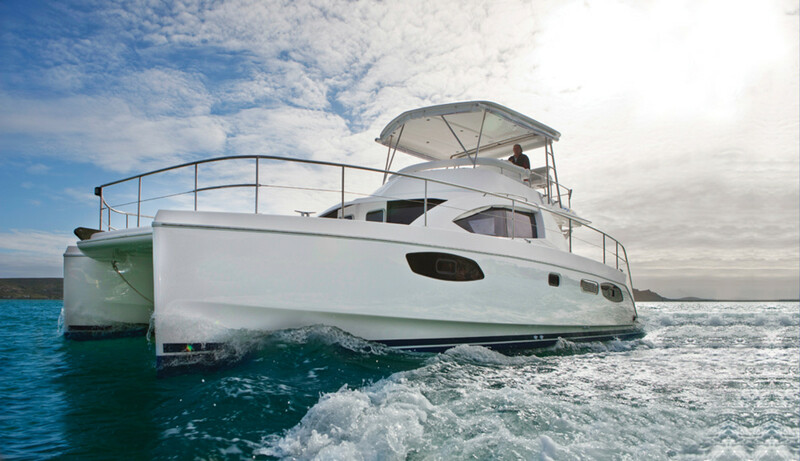 Each hull ends in a wide flat platform that makes stepping aboard from dock or dinghy easy. Another step takes you into the oh-so-wide cockpit with a wrap-around settee to port clearly intended for alfresco meals and sundowner cocktail hours. Clever touch: one backrest flips forward so you can sit facing aft, either to keep an eye on the kids in the water or just to enjoy a good book. A generous sliding door opens to a spacious saloon that, again, is unlike anything you’ll see on a monohull anywhere near this size. The galley is aft, making it easy to pass food to the cockpit or up to the bridge. It is U-shaped so the cook is out of the walkway to the port cabins, and it has a nice selection of amenities, such as the gimbaled Force 10 two-burner gas cooktop with a broiler/oven underneath. It’s fitted with adjustable potholders, but I would have liked spill lips or removable sea rails on the Corian galley counters. Opposite the galley is an ample-sized (56-gallon) Vitrifrigo 12VDC two-drawer fridge/freezer. I loved the cleverly designed trash bin that allows the chef to dump food through a counter hatch, but opens for emptying by the cockpit door. Cherry is used throughout the yacht with laminate bulkheads and solid wood trim, and the entire forward end of the saloon is devoted to a comfortable U-shaped settee with a cherry table. Since the yacht was created with warm-weather chartering in mind, ventilation is outstanding. Two large dogging windows open forward, giving a good breeze at anchor or underway, and electric fans are thoughtfully positioned in the saloon and cabins. 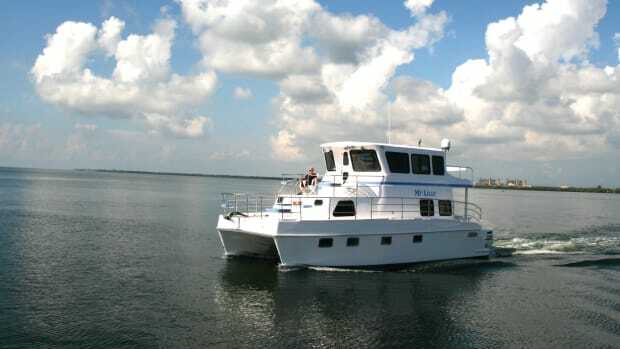 For dockside or generator use, the yacht has Cruisair air conditioning throughout. The master AC/DC electrical panel is so right that I wanted to hug it when I stepped into the saloon. It’s at eye level and clearly labeled so that even those of us with bifocal vision won’t have to hunt for the freshwater breaker. There’s a wide counter below it (to put those bifocals on), and just around the corner, there’s an equally convenient panel with the start/stop buttons and instruments for the Northern Lights 6kW genset, the air conditioning controls, and the lower Raymarine VHF. Remember what I said about subs and crew separation? Well, it’s quite evident in the staterooms, so let’s look there before we go to the bridge. Two layouts are offered for the Leopard 39: a four-cabin arrangement clearly intended for charter service, and the three-cabin “owner’s version” that I tested. The three-cabin devotes the entire starboard hull to a comfortably appointed owner’s stateroom stretching literally from bow to stern. Aft, a berth spans the beam with a size of 57-by-79 inches, which is just an inch or so shy of being a queen size. A large window is outboard with an opening port in the center, and another opening port is aft, plus there is a full-sized hatch directly overhead. Storage is in shelves on each side of the berth, in a pair of hanging lockers. A built-in settee is for putting on shoes, and a desk/vanity is opposite but needs either a swing-out seat or stool. Forward, the head fills the area given to a stateroom in the four-cabin version, so it is comfortable and huge. The shower is in the bow and separated by a Lucite door and panels, so water doesn’t drench the rest of the head. The sink is in a built-in console and is big enough for serious face-splashing after a rum-soaked evening. Our test boat had the optional Jabsco electric quiet-flush heads throughout—again, great ventilation with an overhead hatch and opening port in the large window. What’s particularly nice about the owner’s stateroom (other than that it’s in a 39-foot yacht) is that it is away—away from snoring (or worse) in the other cabins and away from the saloon, which is closed off by a very clever space-saving sliding door. The port hull gets two cabins sharing a head but, again, there is no common bulkhead between the two cabins, so privacy is a selling point. The aft stateroom gets the almost-queen of the owner’s cabin, while the forward berth is slightly tapered and four inches narrower. Our test boat also had the optional child berth in the forepeak, which is accessible only over the pillows of those sleeping in the forward berth. The head that separates the two staterooms is also nicely sized, with a separate shower and molded drain pan to keep the area dry. Storage space for the two guest cabins is limited to a shallow hanging locker in each, plus open shelves. 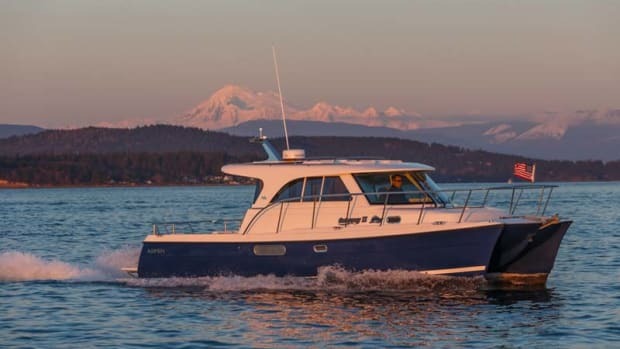 Since there is no lower helm, the flybridge is where you’ll run the 39 and, if cool or rainy weather is in your forecast, I’d opt for the thoughtfully installed soft enclosure that takes full advantage of the fiberglass hardtop. My old knees loved the gentle molded stairway to the bridge, and I liked the good handrails along the way. Once up top, you’ve got to lose that 39-footer mentality all over again. There is walk-around room galore, including an open (but well-railed) space behind the helm for a couple of deck chairs or a sunpad. The helm is aft, and with a high double bench seat, gives good visibility of all corners of the boat, and also allows uninterrupted vision forward over anyone in the settee. The settee wraps J-shaped around the entire forward section and is sure to be a gathering area underway, with comfortable backrests and a small round cocktail table that doesn’t hinder movement. Everywhere you look there are solid handrails, and the stairs are well-protected by solid double stainless steel rails. The helm console is offset to port, with twin displays for the Volvo Penta engines and, on our test boat, a Raymarine Base Pack with VHF, GPS, chartplotter, autopilot, and depth/speed panels. The Morse electronic shifters were on a raised pad at the right height and distance, and the console included a bin for binoculars or sunscreen and a pair of drink holders. I would have liked a footrest, even a folding one, since your feet most likely won’t reach the deck unless you’re tall. Our test boat had the upgraded Volvo Penta 150hp D3 diesels in place of the standard Yanmar 110s found on the charter boats. 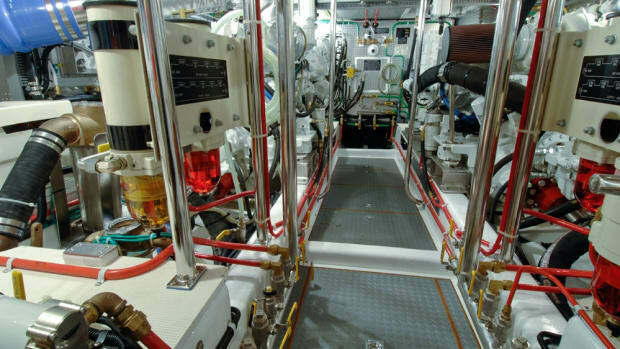 These are installed in each hull of course, with access through gas-lifted and heavily insulated hatches under the aft mattresses. Access is OK for the usual service points, although anything more major is going to require some wriggling and a lean mechanic. Fuel/water separators were mounted outboard and accessible, and the battery for each engine was boxed securely and within reach. Each engine area has its own fixed gaseous fire system. The generator is located forward of the cabin in a deck locker which also provides storage for fenders and lines. In a sound enclosure, it looks to be accessible from the top, but it’s not particularly convenient for checking the oil, although the primary fuel/water separator is located outside the box. That foredeck, by the way, is immense, spanning nearly 20 feet and completely surrounded by double lifelines. The anchor gear is under a long, narrow hatch in the foredeck, with a Quick-Aleph 1,000-watt vertical windlass for the all-chain rode, backed by a sturdy chain-stopper. A hardwired handheld remote controls the windlass, and a rope bridle is provided, both to center the yacht at anchor and to absorb shocks from the rode. Our test boat had the optional Delta anchor, which stowed neatly on the hidden roller. Poking under hatches in the cockpit, I found that our boat had the house batteries upgraded to AGMs under the dinette seat. Other hatches provided access to the rudder posts and hydraulic steering, which includes an emergency tiller. A liferaft box is aft, designed for a Plastimo 6-man getaway. The optional stainless steel dinghy davits are both sturdy and clever. They lift a tender from the water at the touch of a switch that controls the electric winch hidden in the cockpit overhang, and the whole system is simple and easy. Underway, the Leopard 39 is nothing but fun. She feels both light and nimble as well as solid, which is an unusual combination, but most pleasant. In all sorts of seas in the Gulf Stream, she was dry and stable, with a motion that felt like a cantering horse. I suspect she’d be easy on the queasy. And she is silent. At idle inside the saloon, I managed to get a 58dBA reading, but on the bridge at full throttle, I just gave up. Even shielding the decibel meter barely cracked 60dBA and the sound of the wind and water was all we heard—a tribute to the Robertson and Caine soundproofing, and to Volvo Penta. We topped out at 16.3 knots at 3000 rpm, which may not seem much compared to some ocean-crushing motoryachts, but this is a speed you can maintain in a seaway. Even better, we were sipping fuel at just 15.2gph combined, according to the dashboard instrumentation, at full throttle! That’s better than one nautical mile per gallon with the hammers down. Backed off to 2200 rpm, we were cruising at 9.1 knots and—get this—8 gph! Go back to 1800 and 8.3 knots for just 4.2gph. Yeehaw! With 211 gallons of fuel and those numbers, well, you won’t be getting Christmas cards from your fuel dock owner. The Leopard 39 is one of those yachts that just seems right. She’s not long, but she’s big, she’s comfortable, she’s got the right speed and fuel numbers, and she’s incredibly well-proven. This yacht is definitely on my short list, and should be on yours, too.